A report by a Tennessee state investigative office says that testing vendor Questar Assessment Inc. and the state’s department of education both share blame for a series of delays and disruptions that dogged the administration of an online education assessment last year. The performance audit by the Tennessee state comptroller’s office found that the testing company made unapproved changes to its software that contributed to the woes and lacked customer support when problems emerged. It said the state was not sufficiently clear in its expectations and oversight. Enrollments in international, English-language private schools have soared in recent years. In a Jan. 15 webinar, EdWeek Market Brief will look at what K-12 companies need to know about working in those schools. You can sign up here. Both Questar and the education department took issue with some of the audit’s conclusions, and the state agency said many of the proposed fixes to testing procedures have already been made. Tennessee state legislative leaders had requested that the comptroller’s office take on the review. The comptroller also made a broader point about of a series of sweeping changes Tennessee has made to its online testing system in relatively short succession, some of them pushed by elected officials. Those steps included the passage of state legislation that delayed that state’s participation in common core-aligned PARCC tests and led to the development of a new test; the state signing a deal and later ending it with another vendor, Measurement Inc.; and the approval of a deal with Questar. To date, Tennessee has moved forward with “large-scale procurements involving millions of dollars under intense time constraints,” the report says, and therefore must try to “mitigate any risks to continuity and student experiences to the fullest extent possible. The comptroller’s report also includes the results of a survey of teachers across the state, many of whom vented their frustrations about the testing disruptions and urged the state to end the upheaval. “I really don’t understand why so many other states are able to successfully administer online testing, and Tennessee continues to have so many issues,” said one teacher surveyed. “I DON’T think we should abandon online testing, I just think we need better leadership to implement this kind of testing and better partnerships with stronger vendors. The department did not evaluate whether the vendor had adequate internal controls over processing and storing the agency’s data and whether it was ready to properly administer testing through a software-as-a-service application. The state’s department of education issued detailed responses to the findings, in some cases agreeing with them, while disputing other conclusions. It also laid out specific procedures it had put in place to strengthen oversight of testing vendors and make sure assessments run smoothly. The department argued that its work plan was in fact effective in spelling out requirements for the “incredible number” of tasks associated with statewide assessment, and in holding Questar to account for $4 million in liquidated damages. Questar is a wholly-owned, independently-operated subsidiary of Educational Testing Service. In a statement, Tennessee Commissioner of Education Candice McQueen added that the state has already made fixes to many of the concerns identified by the comptroller. She also noted that a statewide test administration in the fall had gone smoothly. Questar officials said in a statement in response to the auditor’s report that they hired an outside company to review its processes after the problems emerged in Tennessee. It also said it did not agree with several of the Tennessee comptroller’s findings. 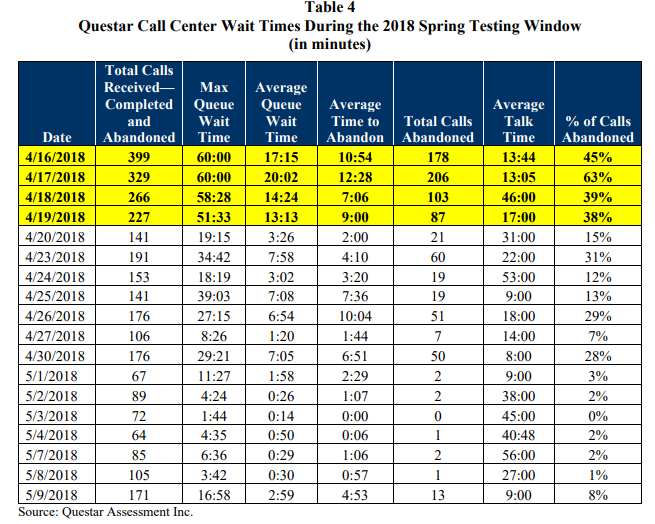 The company conceded it did not have adequate capacity to handle the flood of calls that came in from confused district officials during the testing breakdowns. Questar says it has overhauled its practices for responding since then. Games teach us team spirit. We must play as a team; playing as individuals spoils the chances of victory. Every https://foxdownload.org player cooperates with the other in defeating the opposite side.